I’m a huge fan of the Asphalt series. Many racing games have come and gone on the App Store, from the excellent Real Racing games, to a myriad of awful Mario Kart knockoffs, but the Asphalt games have enjoyed a vibrant life on the iPad that few series have attained. 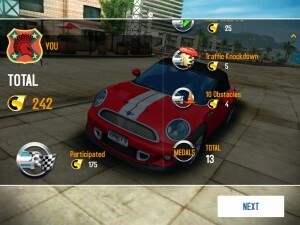 My investment in the series is high, and that’s why Asphalt 8: Airborne nearly broke my heart. 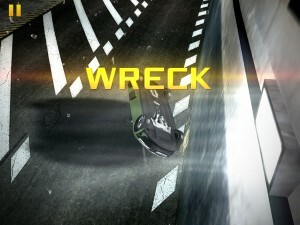 For those new to the series, the Asphalt games are highly polished speed racers. They incorporate many real world cars and locations while maintaing a loose relationship with real world physics. 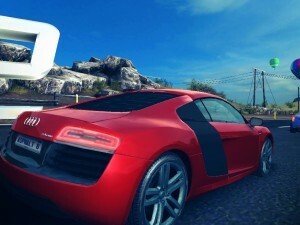 Since Asphalt 6: Adrenaline, this relationship was strained further with the introduction of a nitro boost system, allowing cars to surge at exhilarating speeds. Asphalt 8 shatters this relationship completely by introducing ramps that allow for jumps, twists, and barrel rolls that take cars soaring sky high. The game looks fantastic, and the attention to detail is positively staggering (so much so that some iOS devices may struggle to keep up–my iPad mini struggled frequently with frame rate drops). Environments are strongly detailed, and cars look just like their real world counterparts (I still smile every time I take the Mini Cooper out for a spin). Track design is excellent, whether you’re racing down nighttime Tokyo or dodging double-decker busses on the streets of London. Like previous games in the series, the main campaign is lengthy–there are 8 “seasons” that contain anywhere between 12 to 30 races each. Furthermore, the different gameplay modes are great too. 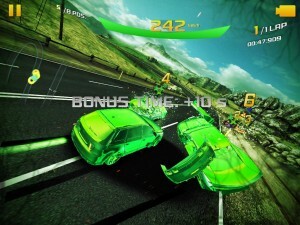 Beyond classic “finish first” mode, there is versus mode, knockout mode (where the goal is to destroy as many cars as possible) and elimination modes. Also new to the series is the introduction of “infected” mode, where the racer in last place is given unlimited nitro, and must to smash into other racers in order to earn time on a ticking clock that is counting down to their doom. I also was fortunate enough to partake in both the local and online WiFi multiplayer, both of which are executed very well–playing games with friends is an absolute blast. It’s too bad that most people will never experience a large chunk of what this game has to offer. 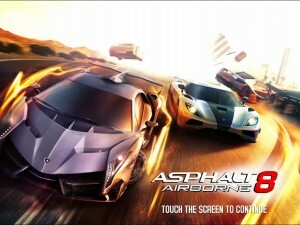 Starting in Asphalt 7: Heat, Gameloft started pushing in-app purchases as a quick way to unlock cars and races. That worried me a little, but it was nonintrusive and you didn’t need to use them in order to unlock everything in the game. That has changed in Asphalt 8. 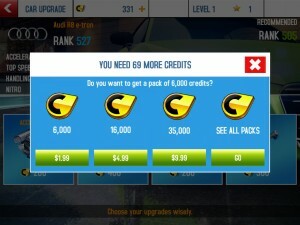 Frequently, I felt as if I was being pressured into buying things in order to progress–and that’s because the game is positively miserly with the game currency used to unlock what you need most: cars and upgrades. Simply put, even if you are a perfect racer, you will not unlock half of the cars in this game without a heavy amount of grinding. That’s a real shame, because not only does that make the game’s difficulty feel unbalanced, but it’s a real turn off to feel like I’m fighting the game to make progress. Something I also found odd in this game are the computer controlled opponents. Somehow they always seemed to know how to reach every single shortcut. Occasionally, this just felt cheap–the player has no way to keep track of all the shortcuts, even after playing a track a few times. Adding to this is the fact that computer opponents frequently have the best cars for each racing class, giving the player a significant disadvantage if they haven’t paid for some extra car packs or upgrade credits via in-app purchases. Asphalt 8 is an amazing game that’s bursting at the seams with content. The attention and polish that this game has received is evident in every corner–from the beautiful graphics, to the great gameplay modes, to the excellent sound design. It’s just a shame that to unlock most of the content you must either engage in tedious grinding or empty your wallet through in-app purchases. The $0.99 entry price is deceptive, and the pricing structure tarnishes what otherwise is a phenomenal game. Though I had a blast flying high with Asphalt 8, this new direction causes me to worry about the future direction of the series. Here’s an App Store link for Asphalt 8: Airborne; it’s priced at $0.99. Disclosure: This app was purchased independently by the post author. For information on our review policies please see our About page. Great review! This is exactly what I hate about so many games these days. It’s why I’m avoiding Where’s my Water 2. I like paying for a good game upfront and getting lots of playing time out of it. I’m almost to avoiding any games with in-app purchases now.